Let me explain. A few months ago, Arbor's leadership team considered the money budgeted annually for holiday cards and wondered if we couldn't somehow use that money to help those in need. So we challenged the staff in our 28 communities to take a small budget – the equivalent of one dollar for each resident and staff member in each community – and come up with a way to help as many people as possible in their local communities. We called it the "What Could You Do with $1?" project, and we are thrilled with the results. I'm truly moved by the creativity, ingenuity, hard work and generosity with which the staff, residents and family members in all of our communities responded to this challenge. In many cases, the projects generated just as much happiness and cheer for those residents and staff who donated or volunteered as it did for the recipients. So instead of a greeting card, I'd like to share a report on our "What Could You Do with $1?" program, so you can see how some of our communities spent their holiday card money to bring joy to many. (We'll share four more stories, in more detail, here in the days ahead.) I can't think of a better way to get into the holiday spirit! Here's wishing you and yours a wonderful holiday season. Many communities used their One Dollar budget to "adopt" families in their communities. With a project titled, "A Basket of Cheer Because You're Not Here," Arbor Terrace of Middletown staff and residents created seasonal baskets, raffled them off, and used the money to assemble a care package for a deployed soldier whose family lives in the Middletown area. 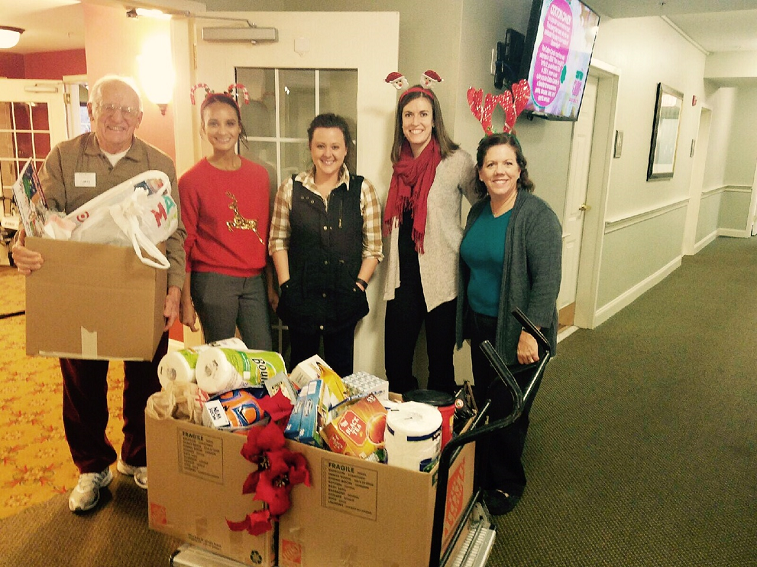 Arbor Terrace Ponte Vedra adopted a local family in need; so many donations rolled in from residents, family members and staff that an entire office in the community was filled with gifts, clothes and food items for the family! Arbor Terrace at Crabapple purchased needed items for a mother and her child living at The Drake House, a local short-term shelter for homeless women and children in the northern Atlanta metro area. In addition, the community collected gently used clothes so that the Mother can interview for a job, and wrote cards with words of encouragement. Arbor Terrace San Jose adopted a local family living on disability benefits due to the mother's dementia. Thanks to donations of cash and needed items from other businesses and organizations, the community was able to expand its original budget tenfold. Arbor Terrace Sudley Manor adopted two elderly couples facing extreme financial hardship and isolation this holiday season. Staff members visited both couples to determine their needs and wishes. With help from residents, they organized a raffle and raised enough money to provide both couples with necessities as well as holiday decorations for their homes. Some communities hosted events as fundraisers. Arbor Terrace of Herndon held a "cocktails and hors d'oeuvres party" to benefit Boulder Crest Wounded Warrior Retreat, the nation's first privately funded wellness center dedicated exclusively to combat veterans and their families. Price for admission was a donated item for the Retreat. With the $120 initial funds, spent on food and donations, the community raised more than $400 in supplies and donations for the program. Barrington Terrace Fort Myers put the skills of a resident, a retired auctioneer, to good use by hosting a festive auction. Families donated items and also purchased items at the auction. With that small initial investment, the community raised $1,000 for a community nonprofit, Blessings in a Backpack, which make hunger-free weekends a reality for children facing food insecurity. Arbor Terrace of East Cobb is making plans to use its funds to throw a party in January at the Boys and Girls Club of Brookhaven. Residents and staff will travel to the Club with food, drinks and goodie bags for the event. The Gardens at Eastside held a donation drive to collect coats, socks, toiletries and nonperishable food for the homeless at Miracle Hill Greenville Rescue Mission. During November and December, family members who visited the community "paid" for their meals with a donation to the project, helping The Gardens to leverage its original budget of $136 into $800. The holidays will be a little brighter for some soldiers this year, thanks to Arbor Terrace Kingwood, which used its funds to purchase snacks and toiletries to send to our troops serving overseas. The residents held a rummage sale to raise additional funds, doubling the initial budget. Many of the residents are veterans or spouses of veterans, so they were especially glad to give back to the military. Many of our communities teamed up with charitable organizations to help make donations go even further. Arbor Terrace Peachtree City partnered with Clothes Less Traveled, a local thrift nonprofit thrift shop, to raise money to help Fayette County Senior Services purchase a new wheelchair accessible van. The Summit of Uptown partnered with the local Kiwanis Club for its holiday food basket drive for families in need in a nearby school district, donating funds and pitching in to pack the baskets. Arbor Terrace Ortega filled 80 shoeboxes with toys, school supplies and hygiene items for children overseas, which will be distributed through the Operation Christmas Child project led by Samaritan's Purse. Arbor Terrace Shrewsbury turned its initial $214 into $405 by selling homemade cards, hosting a Veterans Day bake sale and providing a Thanksgiving Day Feast. The money purchased 27 wreaths through Wreaths Across America, which were laid at the graves of fallen heroes at a local cemetery in a ceremony attended by residents who are veterans. Arbor Terrace Teaneck donated money to purchase a "Rig Bag" with all the necessities for basic life support for the Teaneck Volunteer Ambulance Corps. Arbor Terrace Greenbelt joined the Adopt-A-Shelf program at the Bowie Food Pantry and aims to collect 500 cans of soup and canned fruit, bi-weekly in December, January & February, with help from business partners as well as from churches and other local organizations.